Pterygium (tur-ij-ee-um) and pinguecula (ping-wek-yoo-la) are common growths on the front of an eye. They aren't cancerous. Both happen on the clear covering over the white of your eye (the conjunctiva), and usually on the side closest to your nose. A pterygium is a growth of pink fleshy tissue. It will usually start close to your nose and grow slowly towards the centre. 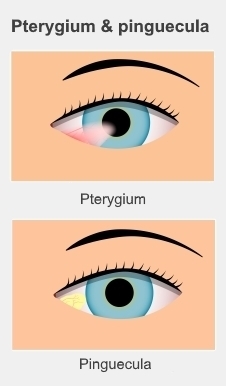 Often there are no other symptoms, but a pterygium can irritate your eye and cause redness. If a pterygium grows onto your cornea (which is the layer in front of your iris and pupil), it can cause astigmatism and blurry vision. You can treat the irritation caused by a pterygium by using lubricating eye drops, and sometimes anti-inflammatory eye drops, which you can get from your optometrist or GP. If it's affecting your vision, or if the appearance worries you, you can have surgery to remove it. Usually you'll have to get this done privately, but if it's severe it may be publicly funded. Talk to your GP or optometrist about your options. A pinguecula is a white or creamy colour, and doesn't grow across your cornea. It can cause irritation, redness, discomfort, and dryness. You can also treat a pinguecula with lubricating eye drops or anti-inflammatory drops, which you can get from your optometrist or GP. It's very rare to have a pinguecula surgically removed, but this can happen if it's very uncomfortable or you're worried about how it looks. How do I prevent pterygium and pinguecula? Both these conditions are more common in people who are outdoors a lot and exposed to UV (ultraviolet) light, or to people who work in dusty environments. The best way to avoid getting them is to protect your eyes when you're outdoors in the sun – wear a hat with a brim, and wrap-around sunglasses that block UV light so it can't reach your eyes. American Academy of Ophthalmology – What Is a pinguecula and a pterygium? Information about pinguecula and pterygium. Written by HealthInfo clinical advisers. Page created December 2017.